Achieve near-direct-drive accuracy from a belt-drive system with the Teac TN-550-B Turntable. Its PRS3 technology is designed to detect and adjust for minute changes in the platter rotation speed for a more accurate listening experience. It has a 2-speed design for playback of 33 1/3 and 45 rpm records and features a static balance, S-shaped, height-adjustable tonearm. RCA cables are included for instant connection to your hi-fi system. This drive system employs a PRS3 (Platter Rotation Speed Servo System) designed to detect insensible changes of the platter rotation speed by a contactless optical sensor settled at the spindle base and controls motor speed after calculation by an on-board microcomputer. It realizes a belt-drive mechanism with higher precision similar to that of a direct drive. Cogging is a phenomenon in which the periodic attraction of the armature and rotor inside the motor is dependent on the rotation angle, resulting in a fine pulsing. For example, if you turn the axle of a motor with your fingers, you'll feel the rotation occurring in steps. The speed selector employs an electronically-controlled speed-changing mechanism between 33 1/3 and 45 rpm, which does not require changing the pulley to another one with a different diameter. The 16mm-thick full-size platter made of acrylic resin is designed to suppress unwanted sympathetic vibrations. By applying carbon coating to the spindle bearing, hardness is increased and electrification is controlled, providing enhanced static electricity performance. Employing a rubber cushion, a large torque motor is settled to float when attached to the chassis. This is designed to suppress the transmission of vibrations from the motor to the chassis. A flat belt is employed to transmit energy to the motor drive. It is also designed to be quiet and provide excellent durability. The cabinet employs artificial marble with high-density MDF. By combining different materials in a two-layer structure, this design abates their inherent resonant frequencies and realizes a clear sound, allowing the artists' voices, which are inscribed in the grooves of the record, to come out vividly. 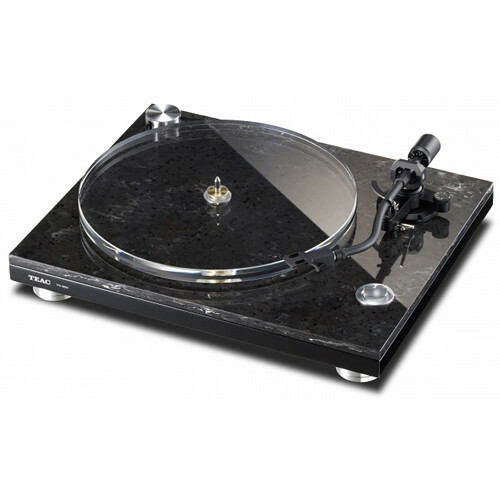 The weight of the artificial marble allows the turntable to realize a heaviness of about 19.9 lb. While it has a rigid structure, it is also designed to assure a high feedback margin. The bottom cover employs a honeycomb pattern designed to prevent unwanted sympathetic vibrations. The four machined-aluminum feet can have their heights adjusted independently, allowing the turntable to be set up on surfaces that are not flat. In addition, cushioned rubber is used between where the feet are installed and the body of the unit to suppress the feedback of sound to the cabinet. The static-balanced S-shaped tonearm features enhanced flexibility. You can adjust the tone-arm height optimally for the shell and cartridge you are using. Also, PC-Triple C conductor cables are employed for the tone-arm cable so that the phono signal captured by the needle from the vinyl record is transmitted with augmented quality. PC-Triple C stands for "Pure Copper-Continuous Crystal Construction" and is designed to allow signals to flow smoothly by eliminating signal obstructions. A pair of RCA Pin jacks are employed on the back panel to deliver phono-level output. An MM-type cartridge is already installed at the factory. Remove the dust cover from the unit if you'd like to watch your record spin. Box Dimensions (LxWxH) 21.4 x 17.8 x 8.4"
TN-550-B Turntable is rated 5.0 out of 5 by 2. Rated 5 out of 5 by Jim from Absolutely Fantastic If you know someone who has grown up listening to MP3 music or, worse yet, satellite radio, This turn table, an amp and modest pair of speakers will blow their mind! The machine itself is a work of art. I know it's not marble but you can let them think it is. The raise/lower and speed controls feel amazing. Sonically, it's as noise free as I can detect, speed is consistent and the supplied cartridge has a nice natural sound. One nit: it would be nice if it lifted the tone arm and stopped the platter at the end like my old Philips 312 but I can get used to it. Still 5 stars.